Pillars of Eternity II Fig Update #8: NPC Portraits Are In, Mystery Stretch Goal? We've hit the next stretch goal! Thank you so much for your contributions to make NPC Portraits, UI Customization and Italian localization possible. We are now are planning to add portraits for every quest giving NPC in the game. This is going to add hundreds of unique watercolor portraits to enhance the experience when conversing with NPCs. In addition, we also will have a full suite of UI Customization features that will be added to the game. Lastly, now our Italian friends can enjoy Pillars of Eternity II in their native language. We all love new concept art. 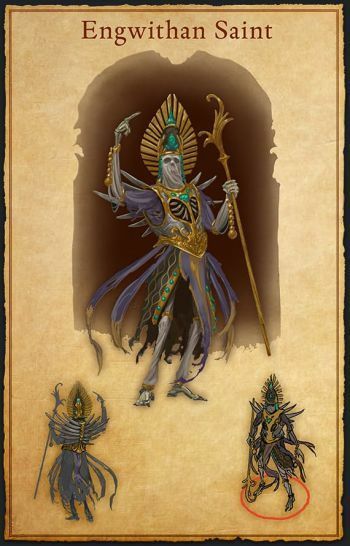 We would like to share the artwork for a new monster in the game called the Engwithan Saint which you can find, and fight, in the desert dungeon featured in our screenshots and video. What could it be? Before the update went out, the stretch goal graphic on the main campaign page briefly changed to show the $2.6M stretch goal being something called "Berath's Blessing", which would allow you to "begin a new game with gifted bonuses". Some people have interpreted that as a New Game+ Mode, which would be a pretty lousy stretch goal even by this campaign's humble standards. Maybe that's why they took it down? This whole thing is starting to appear strangely unplanned. There are 15 comments on Pillars of Eternity II Fig Update #8: NPC Portraits Are In, Mystery Stretch Goal?